Less than six years old, many of my friends and family members are unfamiliar with Megabus. The company claims to be the first in offering express city-to-city service with ticket prices starting at $1. This post explores the positives and negatives of the low-cost, no-frills bus service. There’s only one way to purchase a Megabus ticket – online via their website http://us.megabus.com. Once tickets have been purchased, you’ll receive a confirmation email which doubles as your ticket. Simply print the email and show it to the bus driver upon departure. Using Megabus can save hundreds of dollars – here’s an example of how I’ve saved money through the bus service. Last year I took advantage of a promotion and traveled between Minneapolis and Chicago for the price of 50¢ each way. If I had flown to the Windy City, an airline ticket would have cost at least $150, plus baggage fees and the cost of transportation from the airport to downtown. If I had driven my car, I would have paid for gasoline, numerous toll roads, and parking downtown. All these extra expenses should be taken into consideration when choosing your mode of travel. 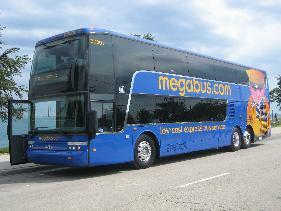 Megabus’s popularity is based on their low price – they claim that most tickets start at $1. This seems to be true of weekday tickets, when purchased in advance. In my experience, tickets that are in higher demand tend to be more expensive. For example, a Friday night ticket will be more expensive than a Wednesday morning ticket simply because price increases with demand. For maximum savings, travel on a weekday. Don’t expect first-class travel. You get what you pay for, after all. People from all walks of life use Megabus. Lots of college students use the service to visit home on a weekend. The elderly, families, lower-class citizens, middle-class citizens, or just people trying to save a buck or two take Megabus. 1. Free (spotty) WiFi is available. 2. The bus is equipped with outlets directly above your seat for charging electronics. 3. There is an on-board bathroom. 1. Depending on when you travel, the bus can be crowded and noisy. 2. Leg room is limited, although this is only a problem if you’re tall. I’m 5’4″ and feel the bus seats are comfortable – my husband is 6’3″ and disagrees. 4. iPod, iTouch, laptop computer, etc. As with any travel situation, be aware of your surroundings. Use common sense – don’t fall asleep with your purse sitting wide-open on the seat next to you. It’s also wise to research the areas the bus picks up/drops off. You wouldn’t want to be waiting for a bus in an unsafe area of town. Visit http://us.megabus.com to book your trip. Taking the Megabus can often be more affordable than driving. Photo courtesy of Megabus. I was just looking for a cheap way to travel from Long Island to Boston. This might really help! Thanks! You’re welcome – have fun! Great looking blog Jess! I would definitely take the Megabus if given the opportunity! By the way, while I use a lot of travel sites, Priceline was my least favorite UNTIL now! I have found some good hotel rates over the last couple of weeks! Thank You! You’re welcome – be sure to try the bidding on Priceline.com if you’re feeling adventurous! My best friend and I discovered Megabus last year and LOVE it for travelling between New York and Boston. The drop off location in Manhattan is perfect and if you’re lucky enough to get a seat at one of the tables, it makes it really easy to use your laptop, eat, etc. Not much more than the super cheap Lucky Star and Fung Wah buses to New York, but nicer. I’ve never heard of the Lucky Star and Fung Wah buses…will have to keep those in mind when I visit the East Coast. Thanks!